For the most part, I’m not one for fruit in salad. But if I’m going to have fruit in a salad, summer–with its rich offerings of fresh, seasonal, super juice fresh fruit–is the time to do it. 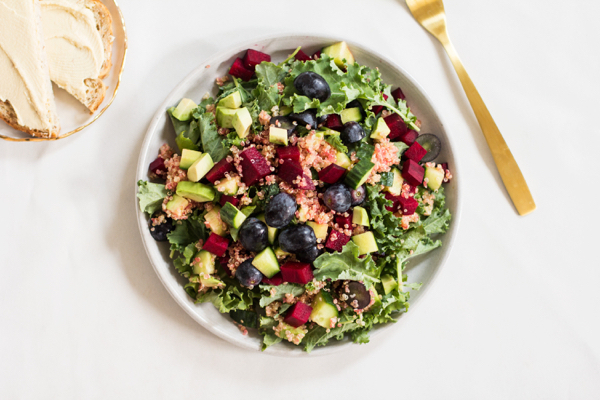 This grape, avocado, and baby kale salad with quinoa is a perfect combination of bitter baby greens, sweet grapes and blueberries, crispy beets and cucumbers, and creamy avocado. If salads with fresh fruit were to always taste like this, I’d probably be a full time convert. 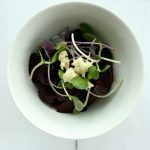 Yesterday, we talked about making veganism accessible with easy, elegant, and healthful recipes. 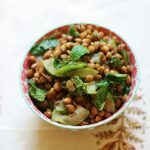 My reader Fiona pointed out that veganism isn’t always quite so easy as I like to make it seem; it can be lonely, and the early weeks, months, or even years can present challenges in the form of cravings for old favorites. I’m glad she raised the point, because it’s important: veganism isn’t always easy. I think it’s easier than the media sometimes suggests, but that doesn’t mean it’s a piece of (vegan) cake: if it were, I suppose a lot more people would be vegan already. That said, the challenges of veganism (as I edited my post to say) are rivaled–and hopefully surpassed–by the joys and pleasures of its food. 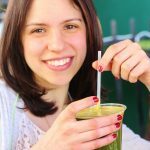 If you’re finding it hard to be vegan, please don’t feel as though you’re doing something wrong, or as if you’re the only one: most new vegans find the transition to be a little bumpy. But don’t feel that you need to give up, either: instead, focus on simple, healthy, and flavorful food that can be put together without too much fuss. If you’d like, you can start with this salad, which is as vibrant and satisfying as it is nutrient-dense. Rinse the quinoa through a fine sieve under running water for about a minute. Transfer the quinoa and 1½ cups water to a 2 quart saucepan. Bring the mixture to a boil. Reduce the heat to low, cover the saucepan, and simmer the quinoa for 15 minutes. Fluff the quinoa gently with a fork, re-cover, and allow it to steam for 5-10 minutes. 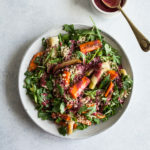 This step can be done a few hours in advance, or you can cook the quinoa a day or two in advance and store it in an airtight container in the fridge until you're ready to make the salad. When the quinoa is ready, add it, along with all other ingredients, to a mixing bowl. Mix and serve. As their starting point. I’m not dogmatic about this, and I’m open to nuance; beans, for instance, fit both the protein and the complex carb bill nicely, as does quinoa. But I’m generally mindful of getting all of my macronutrient groups in, if I can. Frequent nutrient-dense stars in my salads include beans and/or lentils, avocado, sweet potato, tempeh or tofu, raw crackers, nutritional yeast, hemp seeds, raw nut cheeses, and whole grains. I often add protein-rich dressings, such as my liquid gold dressing or my red pepper hemp sauce, for nutrient bonus points. After that, the bulk of my salads is raw vegetables and fruits, with an emphasis on variety and color. This salad falls squarely within all of these lines. 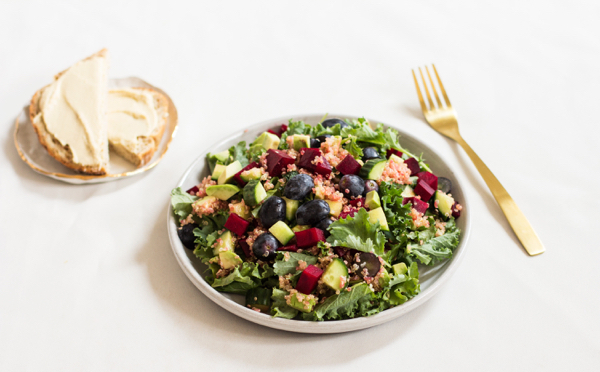 Quinoa provides protein and complex carbs, while avocado provides healthy fat. 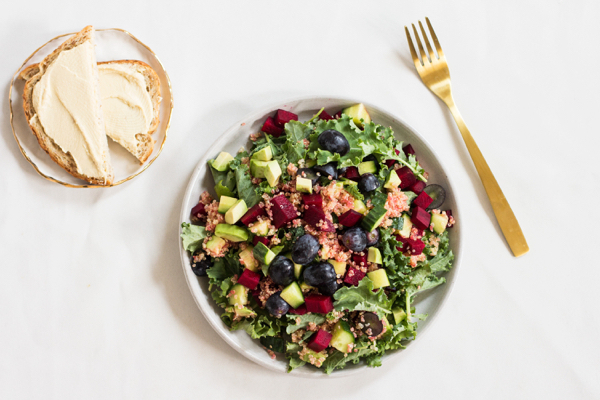 The beets, cucumber, and kale provide a varied array of color and micronutrients (and you could certainly expand on this to include more veggies) while the grapes and blueberries add lovely, bright flavor. Finally, white balsamic vinegar (a mellow relation of regular balsamic) brings it all together flavorfully while also eliminating the need for a great deal of extra oil; the avocado in here takes care of creaminess well on its own. To make it even more filling, you can add some tofu or white beans for a little extra protein power! It’s a beautiful, elegant dish that comes together very quickly if the quinoa is prepped in advance. I hope you enjoy it as much as I do, and enjoy your weekends, too. This post rocks! I honestly waiver between veganism and ploy – I realize they are worlds apart to you!!! – but to those of us eager to have a “real foods”, organic diet, both have separate appeals… Posts like these reply help! That is beautiful! The colours are really elegant. As soon as I saw it I wrote it down on this week’s dinner plan. hi gena – thanks for another amazing looking dish! your meals always have me craving hearty salads with avocado, but i find that i have a lot of trouble buying avocados at my local market… i think that im letting them ripen correctly, but when i cut into them they often don’t taste right or seem to be bad inside. do you have any tips on how to choose an avocado? it’s so disappointing to spend $2 on one and then have to throw it away! Let them ripe at room temperature. Once ripe put them in the fridge. Well, doesn’t that look heavenly. Like any dietary changes, becoming will take some adjustments. I think to those of us who have it down, it can seem easy at least as far as what to make etc. I often feel like that I have no issues with it, it’s others that do. I like your salad combo idea. I almost never put the grains on my salad for some weird reason but I should. beets, baby kale, and a big bowl full of greenery look especially nice right now. Have a great & happy weekend, Gena! I love the attention you put both into visual presentation and into nutritional balancing! I’ve been on a quinoa/veggie/protein bowl lunch kick for quite a while, and have yet to become bored. 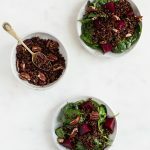 The combinations are endless, especially if you change up the quinoa – the red and black varieties become canvasses for completely different flavor profiles. I favor cooking my quinoa/grains in a low sodium broth to amp up the flavor. Love the look of this salad! I’m loving fruits in my salads at the mo- current faves are blueberries and strawberries. I just read your previous post and comments re. being vegan. I’m still transitioning because it’s hard. I find it easy to be vegan at home or when I’m out and about and starving; especially as I love vegan food. My biggest problem is when I’m eating with family, I just haven’t gotten up the courage to say I’m vegan again (probably because I feel guilty about all my diet changes in the past and ED times); especially as the inlaws don’t get what’s wrong with eating fish and eggs too. I’m going to have to work on it somehow. I agree that cooking vegan at home is actually quite easy but the isolation can come when you start to eat out with friends and family who don’t understand. This salad looks fabulous, Gena, and I can’t wait to try it. Thanks for that tip. I hadn’t heard of Wildflower but i just checked out the link. Hope to make it to the pop up on May 4 or 5. Another delicious recipe for a die hard love that we share: salad… I’m drooling! Yum! i just cooked some quinoa also and i may add this ingredients to it. Healthy fat + complex carb + protein source – love this formula! Simple, yet genius!!! I love this recipe yumm yummm yumm. However, the quinoa is cooked so how is this “raw vegan” ?